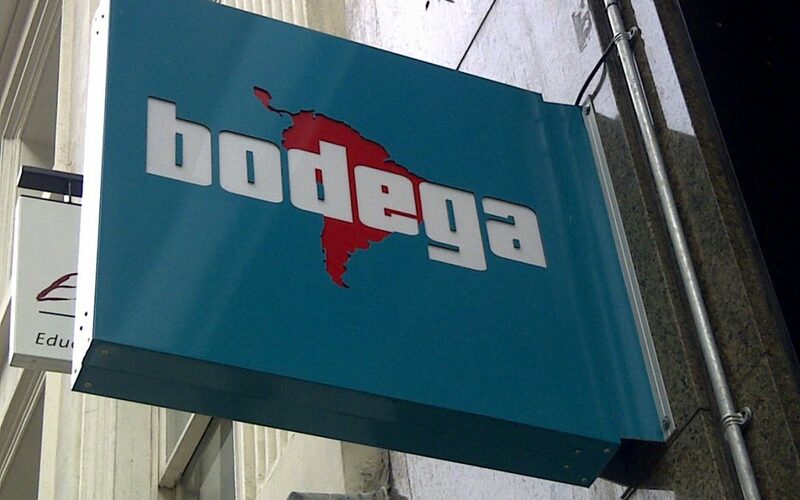 Myself and a friend visited Bodega Bar & Cantina on a Monday evening, and the restaurant was fairly busy but with plenty of tables available not to have to book. The restaurant is a lively venue, being a cocktail bar also, and the decor is bright and colourful. The menu consists of various South & Central American inspired dishes, including larger meals, street food (nachos, burritos, quesadillas & tacos), sides, as well as a range of light bites that either be eaten as they are, or combined into tapas. About 25% of the menu is vegetarian across all categories, but there is also a limited vegan menu available on request. These dishes are around £1 cheaper per dish than their meat based menu items. I plumped for the halloumi burger, which is breaded, fried halloumi cheese wrapped in a toasted tortilla with lime mayo and salsa, served with a spicy slaw and sweet potato fries. My friend went for the veggie tacos, which are tortillas filled with avacado, sweet potato, black beans, salsa, pine nuts and sour cream, which she combined with a side of sweet potato fries. We also dabbled with a couple of cocktails to wash it down with. The food was very tasty, was quick to be served, and fairly good value for money. We thought the service could have been a little better, with the waiter forgetting our request for some water twice, but other than this the staff were friendly and polite. We’d definitely eat here again, and it is a great option for vegetarians, having a good range of interesting and tasty options spread right across the menu.